Researchers created an in vitro human colon crypt array that provides an accurate representation of human intestinal crypts, reported in the February issue of Cellular and Molecular Gastroenterology and Hepatology. This system re-creates an intestinal epithelium with a high density of polarized crypts that respond in a physiologic manner to growth factors, metabolites, or cytokines at the basal or luminal tissue surfaces. The luminal surface of the human colonic epithelium contains a high density of crypts or invaginations interspersed among luminal columnar cells (see figure). Between these cell-covered invaginations lies a lamina propria that shapes and supports the crypt and its cells. Proliferative stem cells and progenitor cells are confined to the basal side of the crypts, whereas nondividing differentiated cells are located at the luminal surface. This microenvironment ensures the unidirectional migration of cells from the proliferative to the differentiated cell zone so that the luminal epithelial cells are replaced every 5–7 days. 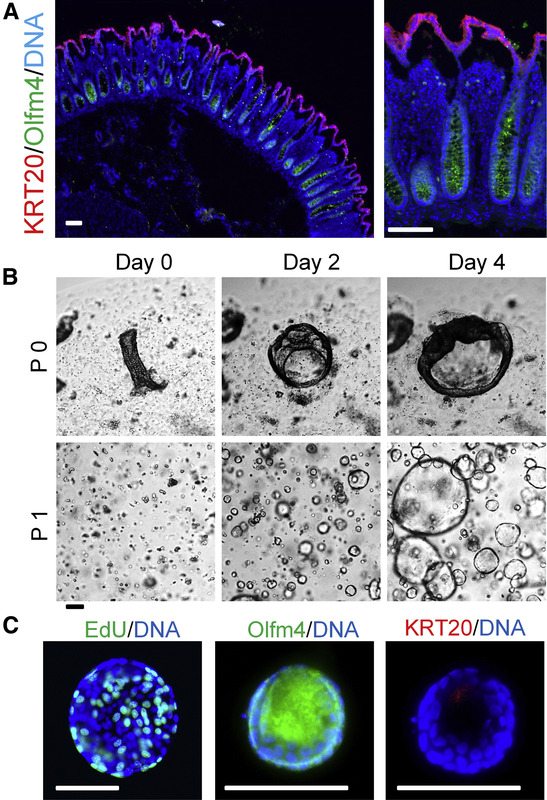 Stem cells of the gastrointestinal tract have been studied using intestinal enteroids or organoids (derived from adult small intestine or colon crypt units), which are grown as 3-dimensional structures, with the luminal surface located inside a sphere. However, factors such as crypt plating density and differences in access to media can lead to random budding and heterogeneity within samples. In addition, it is a challenge to access the luminal surface, making it difficult to study interactions between and epithelial cells and factors or microbes. Yuli Wang et al isolated crypts from biopsy specimens and expanded them as a monolayer on a neutralized collagen hydrogel. 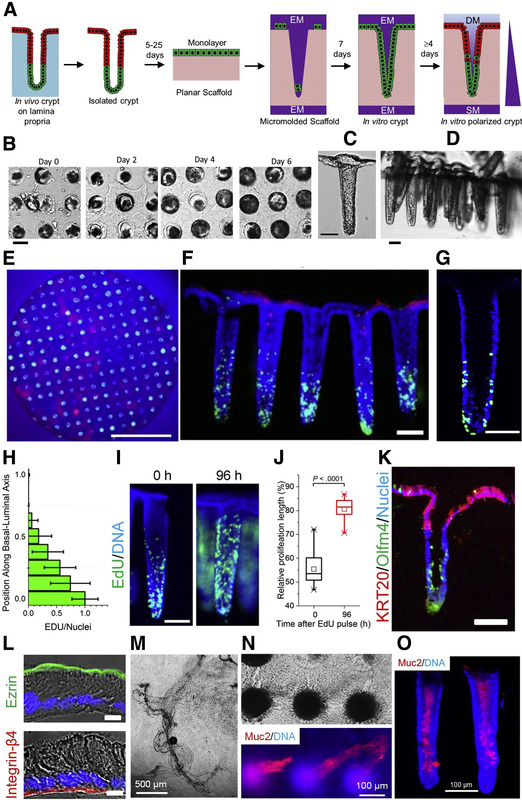 The self-renewing monolayer of human intestinal epithelium was cultured on a collagen scaffold microfabricated with an array of crypt-like invaginations. The cells on the shaped scaffold then were cultured under a biochemical gradient for at least 4 days to polarize the crypts. The authors assessed crypt polarization (size of the stem/proliferative and differentiated cell zones) in response to gradients of growth factors, cytokines, and bacterial metabolites. They found that application of these factors to the shaped epithelium re-created the stem/proliferative and differentiated cell zones of the in vivo intestine. Wang et al applied short-chain fatty acids (acetate, propionate, or butyrate), as a gradient from the luminal side, to the colonic crypt arrays. They found that butyrate increased alkaline phosphatase activity, indicating increased numbers of absorptive colonocytes, and reduced cell proliferation throughout the crypt, restricting proliferative cells to the crypt base. These findings support the previous observation that butyrate reduces stem/progenitor cell proliferation and promotes their differentiation into absorptive colonocytes. A gradient of cytokines, such as interferon gamma and tumor necrosis factor, significantly suppressed the stem/progenitor cell proliferation, altering crypt formation. Wang et al conclude that stem cells obtained from a human colon biopsy specimen can be used to create self-renewing structures that resemble colonic crypts. Chemical gradients applied across the tissue construct lead to compartmentalization of the stem/progenitor cells and promote appropriate lineage differentiation and cell movement replicating human crypt biology. Application of gradients of microbiota-derived fermentation products alters the size of the crypts’ proliferative and differentiated compartments, as they are believed do in vivo. This technology provides an in vitro human tissue platform for the study of drugs and microbiome-derived compounds. In an editorial that accompanies the article, Kathryn E. Hamilton writes that our ability to study distinct crypt/progenitor and differentiation zones in this culture system fills an important gap between in vivo and in vitro studies. She says it will be interesting to introduce finer zonation of the basal scaffold so we can study the contribution of specific paracrine factors to stem cell division and migration. The system could be used to intrduce 1 or multiple cell types (unaltered or genetically engineered) to the basal surface, such as subepithelial myofibroblasts, immune cells, vasculature, and/or enteric nerves.